A philosophical and spiritual look at the current economic depression (which many only call "a downturn"). What are the possible upsides? Recorded shortly after a morning meditation; a worldview expressed shortly after being-at-one for a moment. A few suggestions for meditating right now. Seeing all-that-is from it's basic "as it is" aspect. 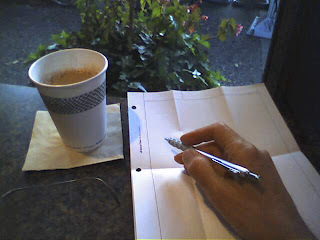 Audio recorded outside after writing and coffee at Peet's Coffee & Tea. It's about the Internet and its power in our life. You can hear background sounds of morning rush hour traffic and the birds!